Throwback Thursday is a weekly meme hosted by Renee at It’s Book Talk. Throwback Thursday is an awesome opportunity to share old favorites as well as older books in our TBR. I love this idea as I’m often distracted by all of the shiny, new books I see every day and don’t make it back to the ones that have been sitting on my shelves. Cate Carlton has recently died, yet she is able to linger on, watching her three young children and her husband as they come to terms with their life without her on their rural horse property. As the months pass and her children grow, they cope in different ways, drawn closer and pulled apart by their shared loss. And all Cate can do is watch on helplessly, seeing their grief, how much they miss her and how – heartbreakingly – they begin to heal. 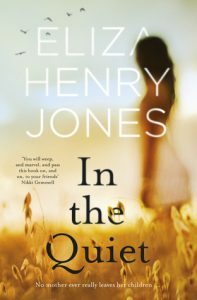 Gradually unfolding to reveal Cate’s life, her marriage, and the unhappy secret she shared with one of her children, In the Quiet is compelling, simple, tender, true – heartbreaking and uplifting in equal measure. In the Quiet is a book that didn’t, in my opinion, receive the attention it deserved. It’s a beautifully written story. Eliza Henry-Jones did a remarkable job of conveying the overwhelming grief and sadness that Cate and her family felt as a result of her untimely death. I read with a heavy heart throughout most of the book. It is difficult to imagine looking down at your children, seeing them in pain, seeing them make mistakes, and being utterly helpless. To compound things, Cate is unable to recall the circumstances of her death. As extended friends and family attempt to help Cate’s family cope with their loss, they continue to unravel. Her husband, Bass, and her three children are all dealing with their feelings in very different ways. Moving on, as a family, will require them to face reality — and one another. In the Quiet is an impressive debut novel. In light of the fact that she wrote this book at just twenty-two years old, I’d say we should expect to hear much more from Eliza Henry-Jones in the future. I’m certainly looking forward to seeing what’s in store. Thanks to HarperCollins via Edelweiss for providing me with a free copy of this book in exchange for an honest review. I think I skipped this one at the time because it reminded me of The Lovely Bones and that was a difficult one for me to read. As a teen, I lost a sister, so this sort of book can be a challenge, but it does sound very well done. This sounds crushingly sad. I’m not sure I could handle that, tho heaven knows I’ve read a couple lately. Guess I’m ready for a few cozies. Crushingly sad is the perfect way to describe it, Virginia. One of those that you have to be in the right frame of mind for. Thanks for stopping by! I’d love to hear what you think if you’re able to sneak it in at some point. Thanks! You’ve got it right – emotional but a great read!